If you have been following my blog for a while, you might remember the time several years ago when God had challenged me to raise my game and take my faith walk to the next level – by memorizing James 1. 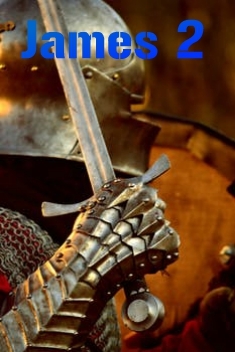 I invited you along and called it my Sword Fighting Class because God’s word is the offensive weapon in our Armor of God. This is how we face the trials and problems of our lives. God’s word guides us as we wake up each day and take our next step. We are wandering on the dark path unless we let God shine his light of truth into our lives through his Word. When it’s etched on our brains, God can use it all day in every situation when there are no Bibles or Bible aps in sight. God and I had an amazing time working through James 1 together. I have a terrible memory – you never want me on your trivia team – but I can remember scripture. That’s God. Through memorizing James 1, I experienced a whole new facet of my relationship with my Father God. It was awesome to have a firsthand seat as I watched God move in my life and make this happen. Since then, I have realized I don’t just know James 1 by heart – I feel the words of James 1, my brain uses the truths in James 1 all of the time to make decisions and my spirit resonates with the wisdom God revealed to me through James. Since then, God has helped me memorize Proverbs 2 and 3 and Psalm 46. Now God has given me a new challenge. Memorize James. Yes, all of James – the rest of the book. There is obviously more God wants me to know and understand. He also wants to prove to me again that he can do this in my life – I just have to do my part. And God asked me to invite you along on this journey. The reality is that God commands us to etch his word on our hearts and minds. We like to treat it as if it were an option – based on how good our memory is or how much time we have. If we want to do what God commands us to do, memorizing scripture is not an option. We’re deceiving ourselves if we look at it that way. James tells us several times to stop deceiving ourselves. That’s one of the things I really like about James. I’m planning to add a verse every week, sometimes adding a couple together since they make more sense together and then taking a couple of weeks to get those totally added to the rest. I’m starting with James 2 – you can start there with me even if you haven’t gotten James 1 down yet. God is going to do some amazing things in our lives as we open up our minds, soak in his word and let him change our thinking from the inside out. It happened to me with James 1 – I’m excited to see it happen again in the rest of James. And it doesn’t matter how long it takes, right? God will bless us each step of the way. He has promised and he always keeps his promises…. So, let’s begin. Watch for my first Sword Fighting Class tomorrow. A Great Light Has Come!